← No-one told the kids! I’ ve always believed in flower power. I’ve always seen the beauty of life in the colour purple, and pink, and yellow and blue. Flowers uplift me almost as much as chocolate (and are better for me!) Even when we are budgeting and tightening our purse strings, I manage to slip a little bunch of bright beauty into the shopping bag. Maybe it’s because my mum always had flowers in the house: Gladioli, Alstroemeria, daffofils to hail spring, orange lillies in summer. 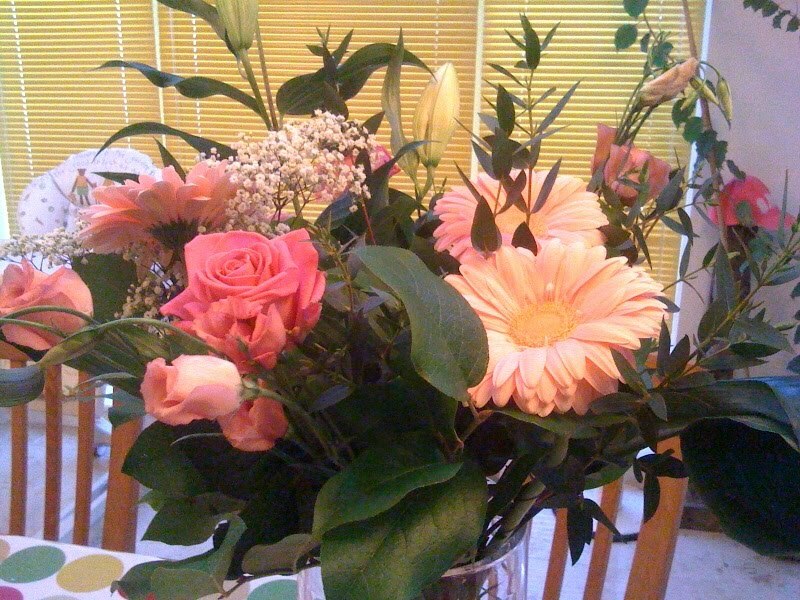 And now as my mum lies captive in her body, my dad brings her her flowers, a little bit of life in her room every day. And when we can, we sit her up in the kitchen to watch the peep show unfold in the garden as blossoms burst out their rioting colours in the garden. Today was one of those days that never seemed to end. Ruby has another tummy bug, so puking and pooing took up most of my time, and the girls endless energy sapped mine. So imagine how delighted I was when the doorbell rang and I was greeted with a pink fest of loveliness – this beautiful bunch of flowers from Interflora (http://www.interflora.co.uk/) courtesy of the equally lovely Rosie Scribble (http://www.rosiescribble.typepad.com/) who nominated me to receive them. Thank you, thank you, thank you. They have brightened up my kitchen, my day and my heart. This entry was posted in flowers, interflora, rosie scribble. Bookmark the permalink.